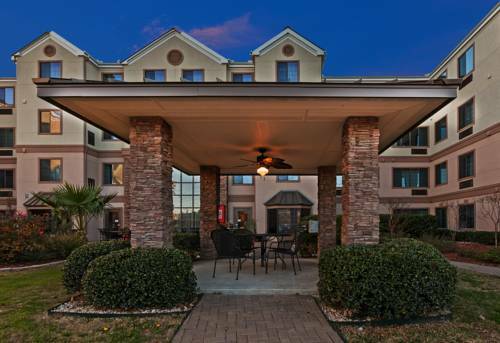 Staybridge Suites NW near Six Flags Fiesta Texas in San Antonio welcomes you and your family. We are within close proximity to Six Flags Fiesta Texas, The Shops at La Cantera, UTSA- University of Texas San Antonio, Valero Corporate Headquarters, Victory Medical Center, Forest Park Medical Center, Nustar Energy, The Rim and Paladium IMAX Movie Theatre, TopGolf, I10 and 1604W. Business and military travelers in San Antonio for an extended stay will appreciate our hotels location near USAA, BAMC, Fort Sam Houston, Lackland Air Force Base and Camp Bullis. For added convenience, the 24-hour Business Center is available to meet your business needs. You can choose from our one or two bedroom suites all with fully equipped kitchens and enjoy amenities such as the complimentary laundry facilities, 24-hour Fitness Center, DVD lending library, storage lockers, pet friendly, complimentary shuttle within a 3 mile radius, two barbeque grills accompanied with a gazebo and an outdoor heated pool and hot tub, not to mention a 24-hour Pantry with all the snacks you crave. For great memorable stay at our Staybridge Suites NW near Six Flags Fiesta Texas Upscale San Antonio Extended Stay Hotel, book your stay with us today. Pet Fees Apply. 484 sq ft meeting room that wiil seat 32. Just over 7,000 yards in length from the championship tees, in the hill country on the northwest side of San Antonio, Texas. A Morrish/Weiskopf design. Carved out of the rolling hills, this golf course is fun and challenging for all levels of golfers. Cedar Creek Golf Course opened in 1989 and was designed by Finger Dye Spann, Inc. A true hill country golf course that will certainly accommodate. Rolling hills and beautiful vistas make playing this course a memorable and challenging experience. Built in Limestone Quarry, this 200 acre theme park offers everything you and your family are looking for in a summer vacation. More than 2.5 million people a year visit the 4 acre complex known worldwide as The Alamo. Most come to see the Historic Mission where a small band of Texans held out for thirteen days against the Centralist army of General Antonio L pez de Santa Anna. San Antonio Zoo is open 365 days a year. ~71 miles from San Antonio.